We hope you enjoy reading of Gary’s past exploits. There are some thrilling stories and many great laughs to be had by reading the history sections of Gary’s long and illustrious racing career. This site is a work in proccess and is still being updated. The forum site is not yet complete but we hope to have it up and running soon. The history sections and others will be updated as time permits. Please visit our sponsors sites and and send them e-mail messages expressing your appreciation for their support. A new season, a new divison, a new car, a new crew, a new experimental motor and alot of new things to learn. 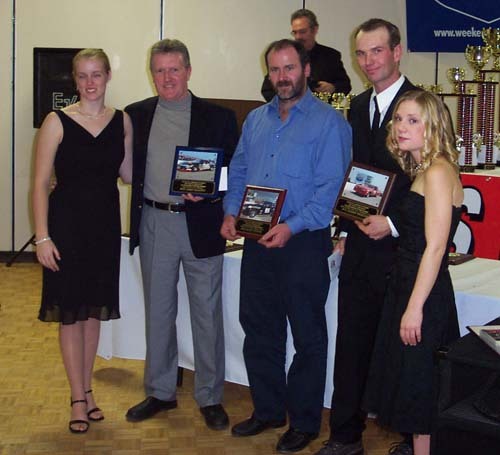 So this is how the new season started for the Gary Elliott Racing Team on May 7 2005, opening day at Flamboro Speedway. By the end of the evening many of the answers had come. 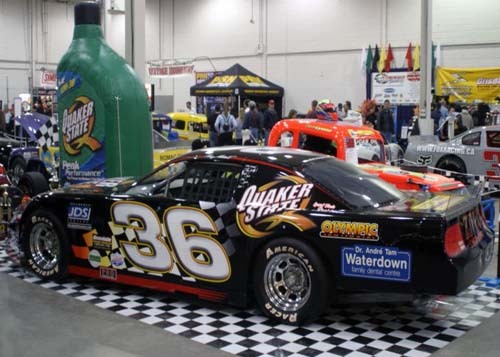 The competition in the Late Model Division was great, the Quaker State 2005 Dodge was good and full of promise, the crew was full of enthusiasm and the new motor was a pleasant surprise. Gary finished 5th in his first heat, 6th in his second heat and drove from 19th place starting position into the top ten before mechanical failure in the rear end forced him to drop out of the feature. 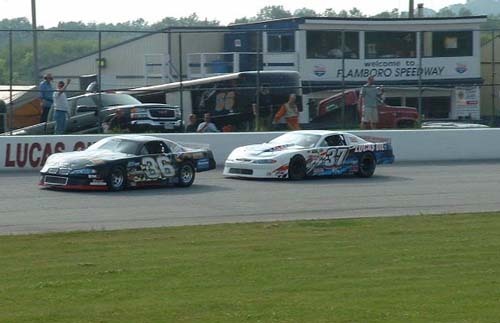 A strong field of 18 Late Models showed up Saturday to entertain the Flamboro faithful. It was a race day that would see sunny warm skies turn to a cold but clear night. Gary finished 7th in both of his heat races. By Feature time both the weather and track had cooled significantly leaving a very fast racing surface with lots of grip. The #36 Quaker State Dodge started 13th and passed five cars to finish 8th. Gary and his crew found themselves at the top of the qualifying order after his two heats at Flamboro Speedway on Saturday night. Gary finished 2nd in both heat races to earn the top spot. To say this was a huge confidence builder for the team is an understatement. In just three nights of racing the#36 Quaker State team earned their first pole position for the twenty five lap Feature. At the conclusion of qualifying a fan drew a number from the track official’s hat which inverted the entire field for the Feature. Gary started 16th in the Feature and had worked his way to 10th place when he was involved in a multy car incident. The Quaker State crew went feverishly to work and got Gary back on the track for the restart. Despite significant suspension damage Gary managed to pass several cars and finished in 14th place. 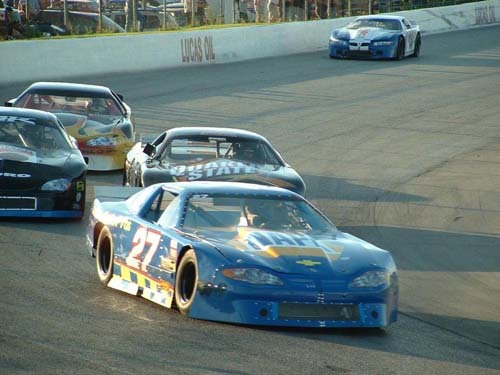 Twenty two Late Models showed up to battle for the first Grisdale Triple Crown fifty lap event. The four qualifying heats were stacked with eleven cars in each race. When the final checker was thrown the #36 Quaker State Dodge was top qualifier with a win in the first race and a 3rd in the second. The crew and fans were excited with Gary’s first win in a Late Model. Gary may have had a shot at winning the Feature, except for the second week in a row the draw was not in his favor. Last week a fan drew #16 out of the hat inverting the entire field, this week the draw was a little better, 15, but still putting Gary back deep in the field for the start. Gary finished 11th in the feature and moved to 8th in the Flamboro points. 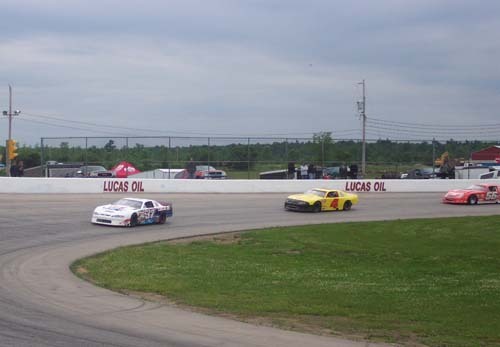 With no Late Model race scheduled for Flamboro Speedway Saturday, Team Quaker State decided to try their first road trip of the year with a venture to Kawartha Speedway. It was a record hot day which produced sauna like conditions inside the race car. Lot’s of water and the desire to race helped to over come the heat. 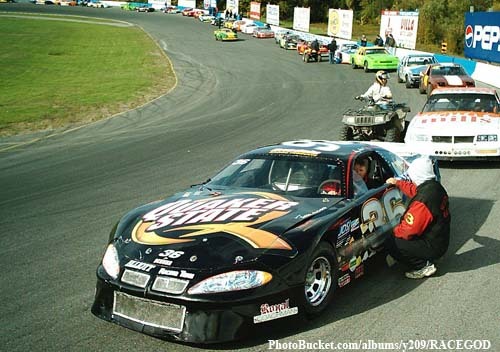 Gary had driven on Kawartha in his Vintage Modified but not in the faster Late Models. It took a few laps in practice and a couple of changes to find the proper gearing for the differential Once the gearing was set the team was ready to tackle this much bigger and faster race surface. Despite Gary’s engine problems the Elliott’s were represented in the C.V.M. Twin 25’s as son David drove the #3, 1933 Plymouth Coupe in the Twin 25’s. 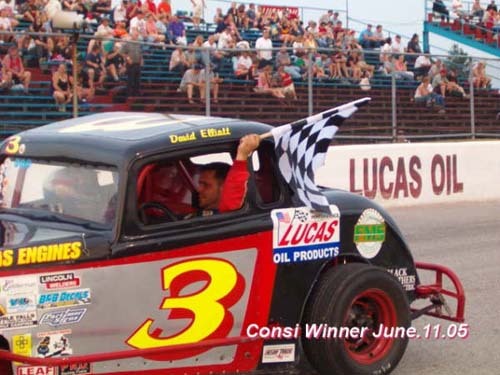 Once again David showed his prowess in a Vintage Modified when he won the Consi. David lined up deep in the field for the first Feature and methodically passed one car at a time to finish 8th. With an improved starting position for the second Feature there were high hopes for a top five overall finish. Unfortunately David had to retire from the second Feature when the steering rack broke on the first lap. All the Elliott fans hope that both Gary and David will have rides for the 2006 C.V.M. 40th Anniversary Special Events. Despite several hours of hard work the Quaker State Team was unable to repair the engine. 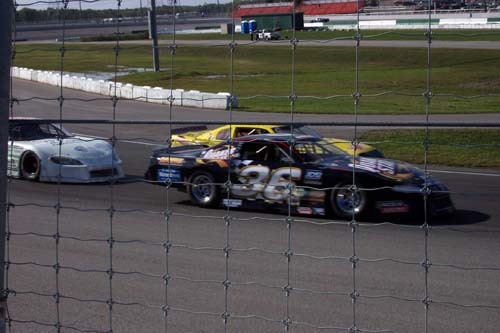 The Canadian Vintage Modifieds ran their Thirty First Twin 25’s on June 11th at Flamboro. Gary had competed in every event since the inaugural race in 1975 and was really looking forward to his return to the #36, 1933 Quaker State Chevy Coupe for this year’s event. It was not meant to be however as engine problems developed on the car during the first lap of practice. The engine problem would prove to be terminal and for the first time ever Gary failed to qualify for the event. Delay in action due to a crash in turn one. David leads the #4 Terry King and #56 Jeff Stewart. Most North American manufacturers have undergone concerns with brake pulsation in some of their vehicle lines. Customers complain of a brake shudder when slowing down or exiting a high way at 60 mph. Now magnify that 10 times when a 3,000 pound, 400 horse race car is entering a turn at 90 plus mph. The vibration can be severe enough to shake the driver’s hands off the wheel and make steering the car next to impossible. That is the problem that has been dogging the Quaker State Dodge Team for the past few weeks. David leads Gary in early heat race action. 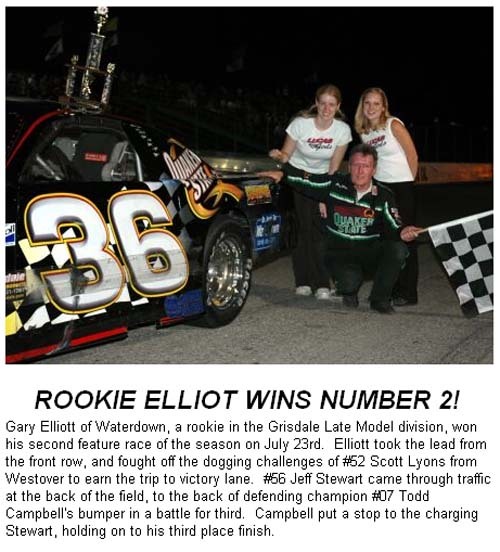 Feature win story as it appeared on Flamboro Speedway Website. 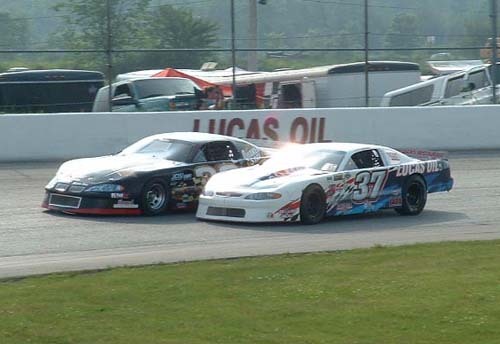 Gary leading David down back straight enroute to his first Late Model Feature win. What a night for the Elliott Racing Team! 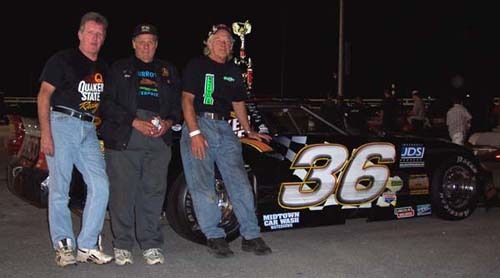 In their sixteen year run with the Vintage Modifieds, Gary and David had six nights when they finished first and second in the feature. Of those six nights David won five times. In only seven nights of Late Model racing together, they have already notched their first one/two finish; only this time it was Dad in front. This is what happens to a piston when a valve breaks! 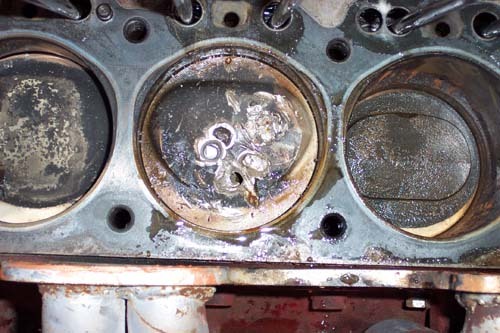 This is what happens when a valve breaks, falls into the combustion chamber and is struck by the piston when it comes up. Note the broken valve wedged into the shattered head. 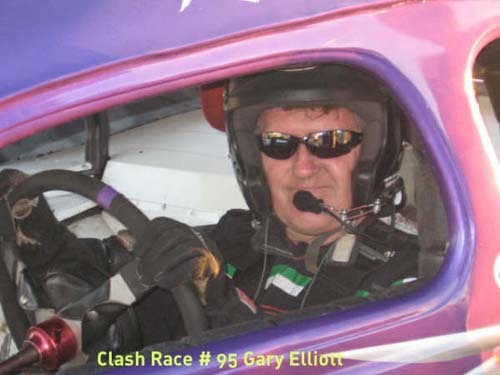 For the second time this year Gary attempted to race with the Canadian Vintage Modifieds, at Varney Speedway on Friday Night. For the Second time Gary had his hopes dashed as the car suffered terminal engine failure while he was leading the Consi. Gary had obtained a ride in the #3 1933 Plymouth Coupe and it was decked out in the Quaker State colors for this event. When the Team arrived at Varney it was sunny and warm. Within a very short time span the wind picked up blowing in cold air and storm clouds. Gary was only able to get in one practice session but this was during a rain drizzle. Due to the wet track conditions making it difficult to figure out the cars handling no adjustments were made. Gary started pole in the first heat and quickly discovered that the car was so loose that it was on the verge of spinning out. Gary dropped to the rear of the field and settled for finishing the race with the car in one piece so that chassis adjustments could be made. The Team work feverishly changing tires, stagger and the chassis. Gary started pole in the Consi and at the drop of the green flag he quickly pulled away from the field. By the third lap Gary had about a ten car length lead and appeared to have the car set for a great Feature run. It was not meant to be however as Gary exited turn two a large billow of smoke erupted from under the hood. 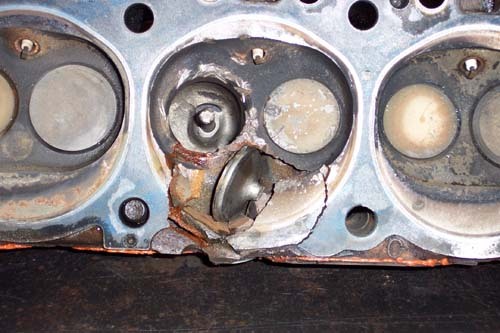 A valve had broken destroying the head and a piston. The engine failure was terminal. 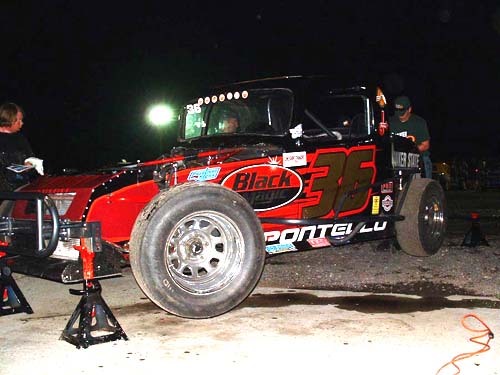 Gary hopes to make another run with the Vintage Modifieds later in the season. Despite having to restart at the back of the field twice Gary managed an eights place finish on Saturday night. Leading the pack enroute to third Heat win of the season. On Saturday night Gary duplicated his heat performance form the previous week with a win and a fourth. The heat win was the fourth checker flag of the season for Team Quaker State. In the Feature Gary drove from his ninth place starting position smoothly to the front and caught up to the race leader, reigning Track Champion #07 Todd Campbell. Gary & Todd staged a great duel for the lead with Todd getting the checker and Gary the runner up. 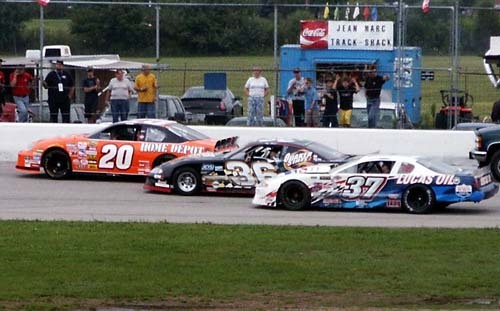 On lap one of the Feature a five car pile up took place near the front of the field. Gary safely navigated his way through the carnage. Restarting fifth Gary quickly disposed of fourth and third place competitors and soon after passed for second place to settle in for a duel with the 2004 Track Champ. Todd was steady and drove a perfect race. Sitting less than a car length off Todd’s rear bumper for the final 15 laps Gary would test Todd both high and low on numerous attempts but with no success and the Quaker State Dodge cross the finish line in second place. 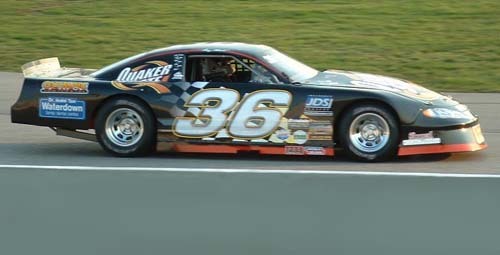 Team Quaker State paid a visit to Delaware Speedway Friday night. It was Gary’s first ever 75 lap race. 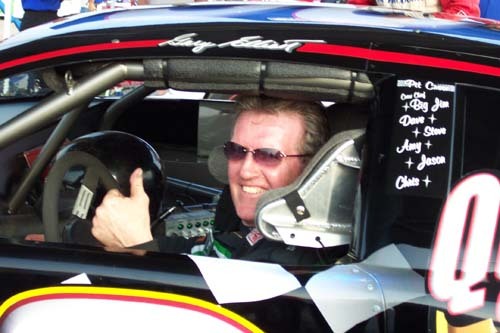 Gary has lots of race time at Delaware’s big ½ mile oval but none in the Late Model. Due to work commitments the Team was late for warm ups. That coupled with changing from Flamboro’s 10” tires to Delaware’s 8” tires hindered the team’s effort to get a good chassis set up. As a result the car was not up to its full potential resulting in a fifth place finish in the Heat race. The crew made some adjustments to the chassis and hoped for the best. At the drop of the Green for the 75 lapper Gary discovered that the car was very loose and dropped back to the tail end of the pack of nineteen cars. Gary then slowly developed a racing line that was most comfortable for the car and he began to slowly move forward in the pack. By the mid way point Gary had moved the Quaker State Dodge into sixteenth place. A couple of competitors dropped out of competition due to mechanical problems. In the closing laps Gary stepped up his pace and passed a couple of cars and eventually drove across the finish line in twelfth place. It was not the result the Team had hoped for but when all things were considered it was felt that some valuable knowledge and much needed W.W.S. points had been gained. Gary is now thirteenth in the W.W.S. that consists of drivers from Kawartha, Delaware and Flamboro. 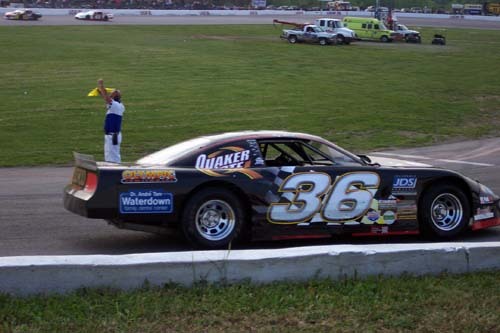 Feature Win #2 Story as it appeared on the Flamboro Speedway website. Dream Season Continues Win #2! 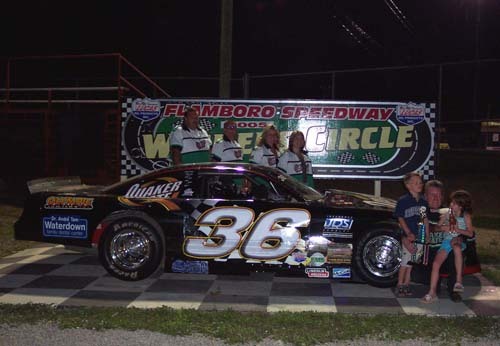 The Dream Season Rookie Campaign continued Saturday night at Flamboro Speedway when Gary drove the Quaker State Dodge to his second Feature win of the Season. He then celebrated his win with a “grass burnt out”, much to the delight of the fans. 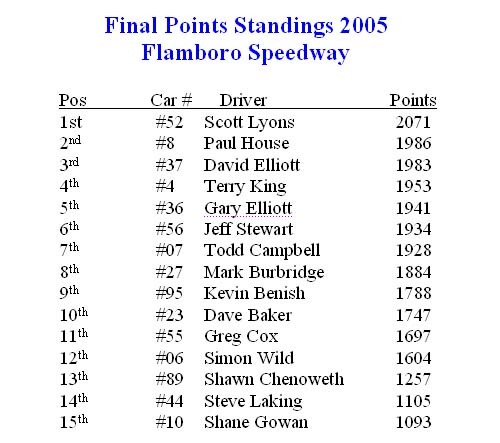 With the win Gary moved to 5th place in the Flamboro points. Gary leading # 10 Shane Gowan enroute to victory in the second heat. 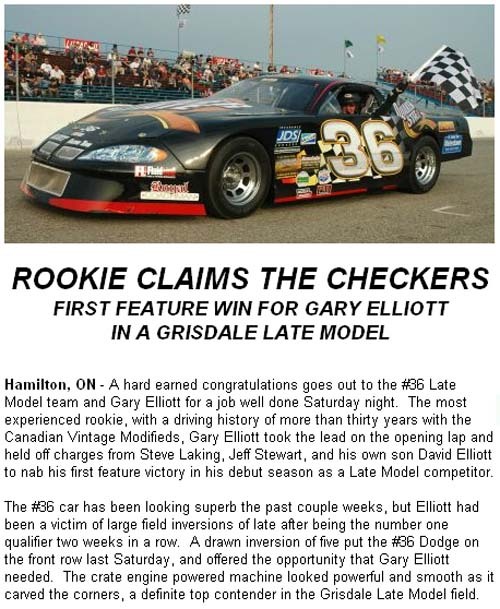 Despite having to add an extra 150 pounds of weight, a 12th place starting position and a late race incident that put him to the back of the field, Gary drove the wheels off the Quaker State Dodge and raced to a fifth place finish in the Grisdale Late Model Series on Saturday night. Another trip west, again on the small tires, a much bigger faster track and an ultra competitive field of local Delaware drivers. 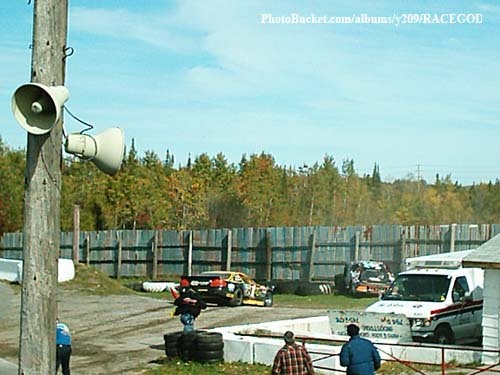 Once again Team Quaker State had a night of hard lessons at one of Ontario’s big tracks. Some things were learned and despite some initial frustrations Gary managed to bring the Quaker State Dodge home to an eleventh place finish. Flamboro Brings Another 11th Place Finish! 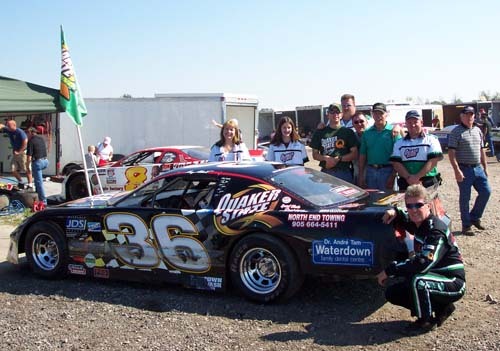 After a frustrating run the night before at Delaware Speedway Team Quaker State was looking to rebound at Flamboro. Some stiff competition, a slight miss on the chassis set up and a late race spin into the infield to avoid an accident resulted in a disappointing eleventh place finish for the Quaker State Dodge. Gary and David excited the fans running three wide down the back straight with Tony Stewart! Ok so not really. The Home Depot car is a promotional car that tours the country. Quaker State Dodge Takes 4th in Final Round! Fans of Gary Elliott and the #36 Quaker State Dodge sure got all of their emotions working on Saturday night. 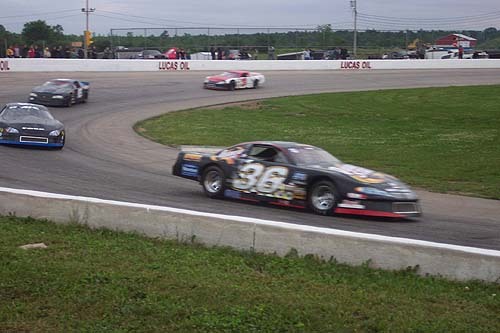 Flamboro Speedway was home to the final leg of the Grisdale Triple Crown Series for Late Models. There were several guest Teams from other tracks present making for a very full and competitive field. Pre race anticipation turned to happiness with an excellent second place qualifying session. Frustration followed with being involved in two accidents during the 50 lap Feature race. And finally shock and elation with events that lead to a come from behind fourth place finish with a damaged race car. Post race celebrations included a photo session and reminiscing about the good old days with Gary, Vic Parsons (Limited Late Model) and Bill Burrows (Open Wheel Modifieds) three of the sports longest enduring drivers. The above photo is of Gary, Bill and Vic. The trophy is Vic’s for winning the Limited Late Model Feature. 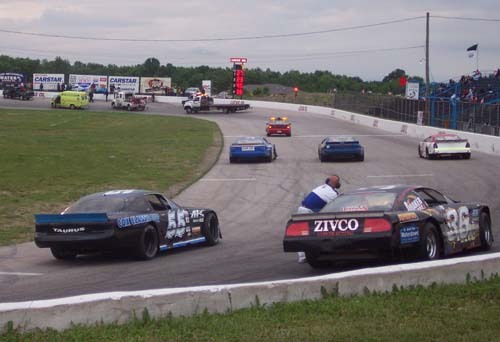 Looking to build on their June experience Team Quaker State ventured to Kawartha Speedway on Friday night. The Team was not to be disappointed in the efforts to improve the car since the June run. Gary finished fifth in his Heat race and followed that up with a smooth and consistent run to a seventh place finish in the Feature race. Consistency at Flamboro Pays Off. 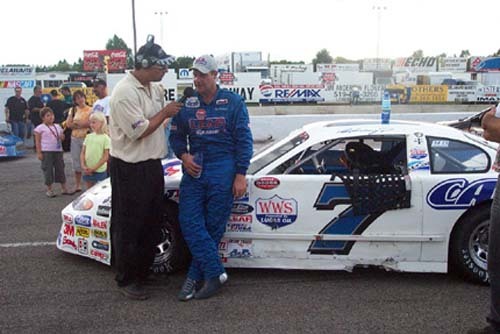 On Saturday Gary won his seventh Heat race of 2005. He followed that up with an eighth place finish in the Feature. The consistency of this weekend’s finishes helped to propel Gary and Team Quaker State into sixth place in the Weekend Warrior Series. 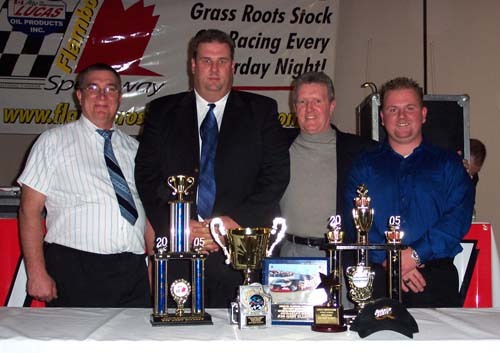 The Weekend Warrior Series was created to support grass roots racing in Ontario. The series will determine who truly is the best of those Late Model racers who are dedicated and desire to race as much as possible. 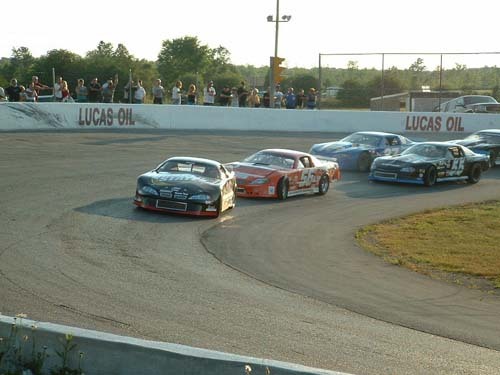 Every WWS race facility in Conference A, Kawartha, Flamboro and Delaware Speedways, are eligible to host WWS races throughout the season. These tracks are very close in rules, allowing cars from other tracks to visit on nights off or when their own track is not running. The more a driver races, the more points he will accumulate. 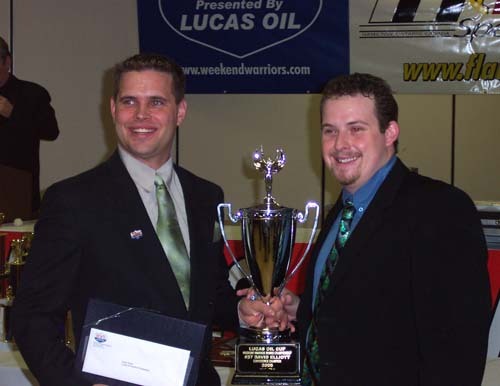 Many drivers want to run a limited schedule; however the die-hard racers will now be recognized through the WWS. 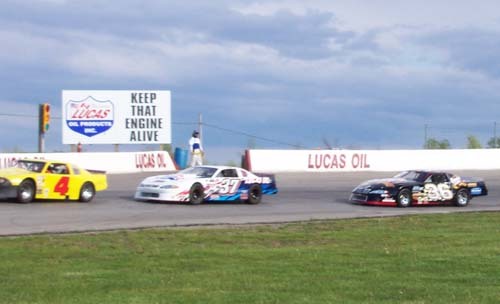 On Friday night Team Quaker State again visited Kawartha Speedway. Gary showed strong power in the heat. 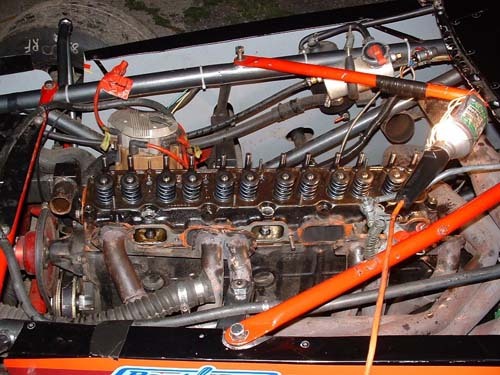 A chassis change was attempted for the Feature. It turned out to be the wrong way to go and Gary had to fight an ill handling race car for the thirty lap race. A twelfth place finish however did provided Gary and his team with enough points to move them to fifth overall in the WWS. 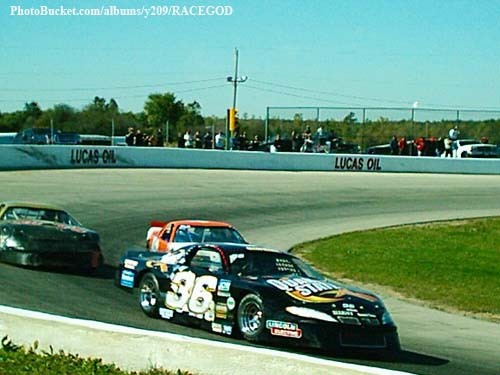 Kawartha Speedway is one of the nicest race tracks on the circuit. It is wide, high banked and very fast. 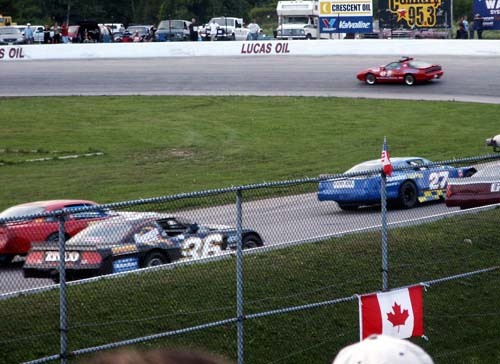 On September 16th, Kawartha will host their Second Annual Summer Sizzler, a grueling Triple 50 lap format that will attract up to forty of Ontario and the U.S. best Late Model teams. Gary and his crew learned more about track set up on this visit and will use that knowledge to get ready for next Friday. David finished sixth and moved closer to his goal of the WWS Championship. Point Battle Heats Up With 2nd In Feature! A strong second place finish by Gary in the Quaker State Dodge on Saturday night served to really tighten the race for the top five in Flamboro Late Model Points. Eight Teams are in a tight battle for the prestigious top five positions. Gary is currently tied for fifth with #56 Jeff Stewart and is only eight points back of fourth place Terry King. A top five finish in the points would be considered an outstanding accomplishment for the rookie Quaker State Team. Looking out on Deer Bay from the front of Beachwood Resort. 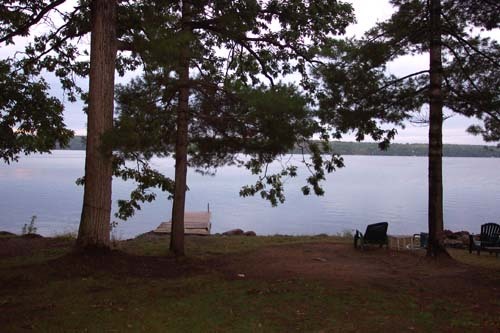 Deer Bay is located on Buckhorn Lake in the Kawartha Lakes region and is home to some of the greatest Bass, Muskie, and Walleye fishing anywhere. 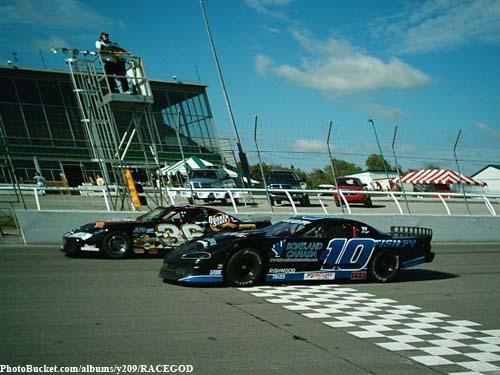 Dave Morgan is the driver/owner of the #10 car Kawartha Late Model division. 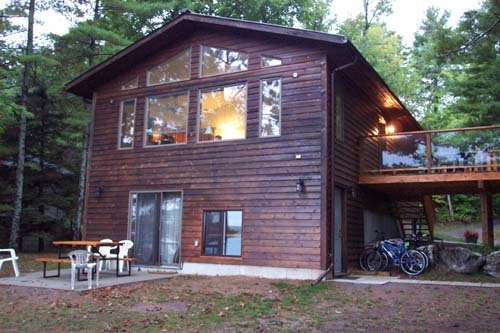 His family operates Beachwood Resort on Deer Bay in the Kawartha Lakes. When it rained Friday night Dave found room for the Quaker State team at one of his cottages. Once they were settled in the team dried off and then made their way to the main lodge for a feast fit for a King. 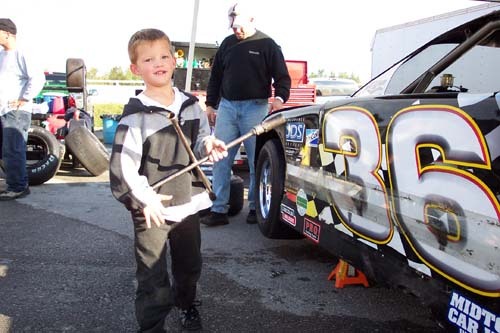 Gary’s grandson Gehrig is seen here hard at work on the tires. Both grandchildren Gehrig and Lauren are valued members of the Quaker State pit crew. 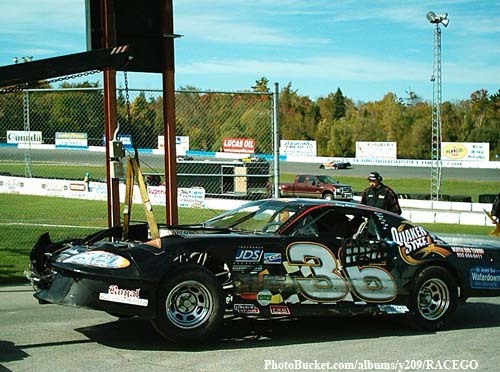 In his thirty plus years of racing Gary has never competed in an event of the magnitude at Kawartha Speedway on Saturday. 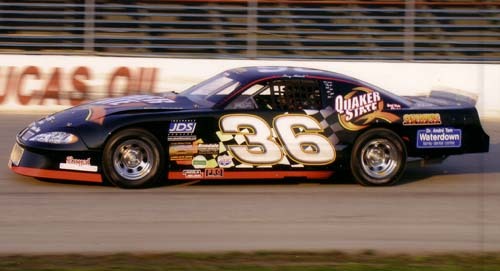 The lack of power steering was a major factor in limiting the Quaker State Dodge to 24th, 23rd and 15th place finishes in the triple race format. The Quaker State team was blessed throughout the season with some very skillful, legendary help. In the attached photo Gary, Thatcher Krupp and Junior Hanley discuss suspension changes. Spectacular Run Earns Top Five Finish in Points! 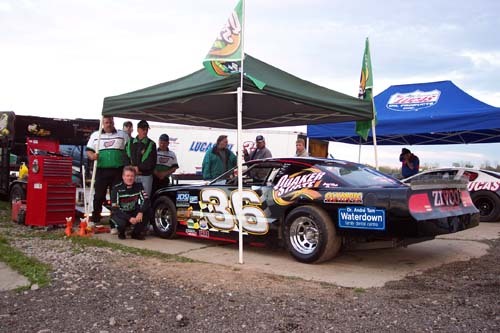 Heading into the final point’s race at Flamboro Speedway, Gary and his crew were tied for fifth with #56 Jeff Stewart. It had been their goal at the beginning of the season to try for a top five point’s finish. The dream was now on the line. 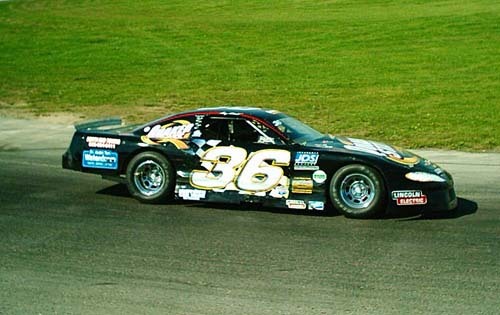 Jeff was one of four drivers in the top seven who, in the past five years, had won a Late Model Flamboro Championship. 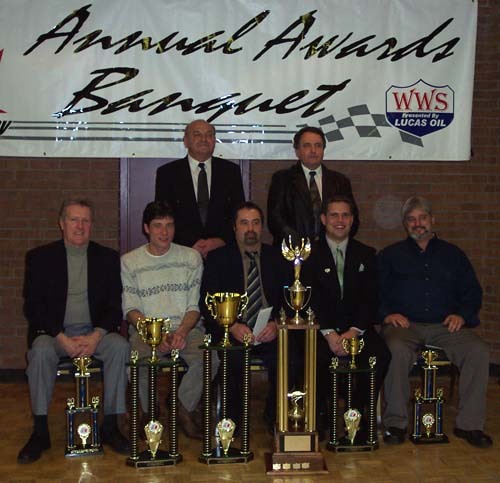 Gary and David were the only two in the top five to have won a Vintage Modified championship. With every point crucial, heat races were very important throughout the season. However, something terrible went wrong in the first heat after moving to fourth early in the race. Suddenly the car swayed back and forth on the front chute with huge plumes of white smoke coming from inside the driver’s compartment. The left rear support bracket that held the trailing arm and shock absorber broke off. This caused the rear end housing to twist sending the car sideways. Jeff would gain points in that heat with Gary towed to the pits. 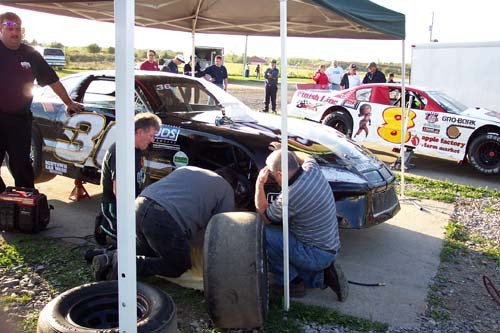 Though bewildered by what they found the crew assisted by the legendary Junior Hanley and Jim Ward worked hard to get the car ready for the feature. The broken bracket was welded in place; the left rear shock replaced and the suspension reset. Because of the speedy work by the crew, the car was ready for the second heat. A sixth place finish helped cut the lead, but Jeff would start the Feature with an eight point cushion. There is a one point difference for each position, plus a point for every positioned gained from the original starting spot. Jeff would start sixth and Gary sixteenth. 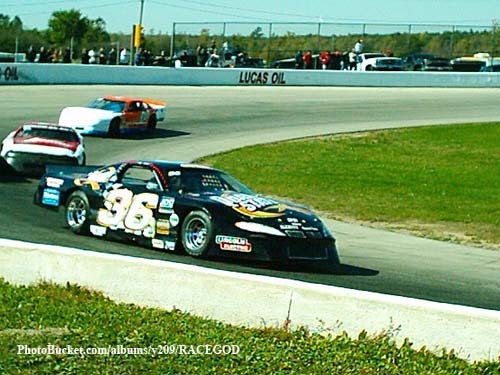 Gary drove Rick Warnes’ #95 car in the Canadian Vintage Modified 2005 Clash on Saturady. Gary finished third and sixith in the two segment race. Thanks Rick for the loan of your car. Time in the pits prior to the race. A great time for a team photo. After a good run in the heat race on Saturday the team made more adjustments to the car. In Sunday morning practice the Quaker State Dodge was a rocketship. The team was full of anticipation for the 100 lap Feature. 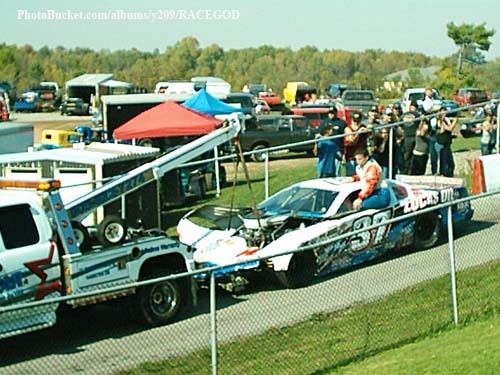 Dave and Gary both experienced their worst wreck of the season when Gary was forced into the wall on the back straight. Dave was following close behind his dad, had no time to stop and ran into Gary wrecking both cars. The Oktoberfest Show was filled with excitement. 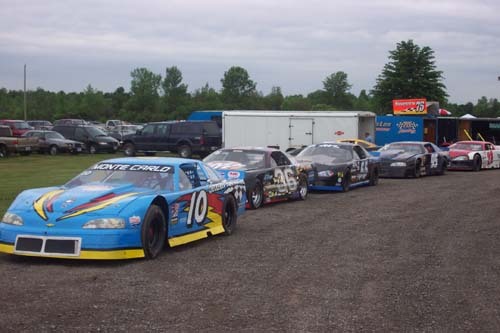 It would be Gary’s first ever 100 lap race bringing with it some of Ontario’s best Late Model drivers. Qualifying was done on Saturday October 1st. A record thirty two cars battled for twenty four spots. For this event there would be only one heat each for qualifying. The Team had prepared the car well for the qualifying heat. Gary was in top form and drove the Quaker State Dodge on the edge throughout the short race. Gary brought the #36 Dodge home in second place behind son David. The second place finish qualified Gary in sixth place. David picked up his eight victory of the season in winning the heat. A fan then drew the number sixteen for the invert putting Gary in eleventh place on the starting grid for Sundays 100 lap Feature. Following the accident many people from numerous teams chipped in to help the Quaker State Team repair the car. Although we were unable to make the car as competitive as it had been prior to the accident, it was a testiment to Gary’s will that the car was put back together so it would be safe to race. 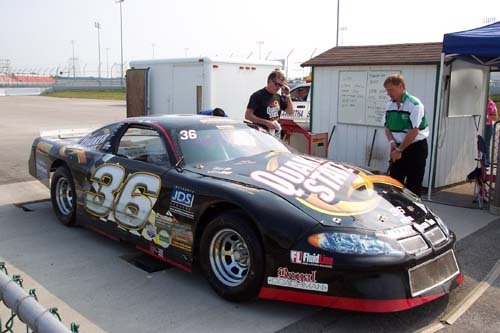 Gary would like to thank his son David and Ed Askin from the #37 Late Model Team Vic Parsons and his crew from the #1 Limited Late Model Team, car builder Mike McColl, and all the other people who pitched in to help repair the Quaker State Dodge. Imediately follwing removal off the big tires the car was towed to the pits for the repair work to begin. The safety crews responded quickly to the scene. Gary was ok but the car was severely damage. It took awhile to get the Quaker State Dodge off of the tires. Quaker State Dodge Fastest In Practice! The Quaker State Dodge was turning the fastest times in the field during practice. This photo was taken on the lap prior to the accident. 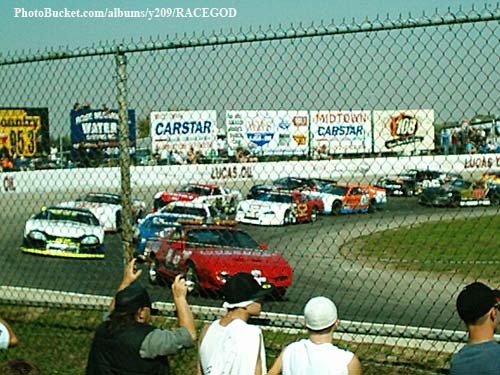 The pits were a sight to behold as they were jam packed with all the best race cars in Ontario. Despite the congestion the track did a supurb job all weekend of keeping things on schedule. First thing Saturday morning the cars all had to clear pre tech prior to practice and races. The line up was long but it was a good time for commiserating with other drivers, fans and friends. The Final Weekend Warrior Series Standings. To the thrill of the Elliott’s and their fans, David won the Late Model Championship and Gary finished third! What a year for a Rookie Team. Although tired now I am sure that in short order the Quaker State Team will be pumped up and on pins and needles in anticipation for next season. Horrific Crash at Peterborough! Team Doesn’t Quit. With WWS points on the line and the desire to hold on to third place, Gary and the Quaker State Team hoped their debut at Peterborough Speedway would be a success. The car was methodically prepared during the week with the damage received at Flamboro repaired. What the team wanted was to finish the season with a good performance. What happened was incredibly bizarre. 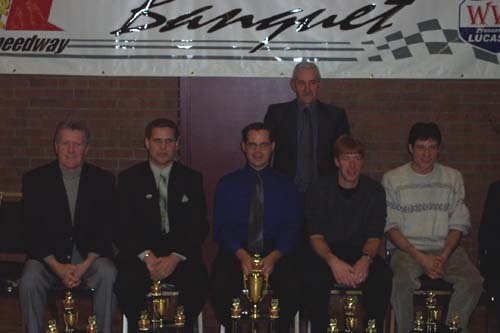 Gary and his crew with the awards for their 2005 season. 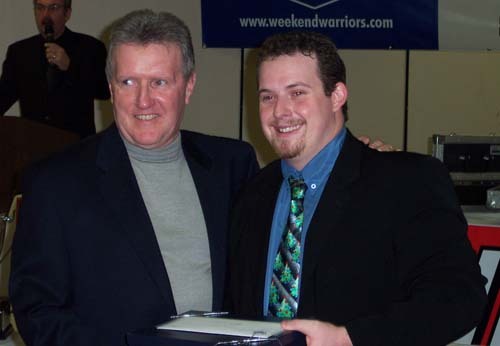 Gary And Nonie Celebrate A Great 2005 Season! 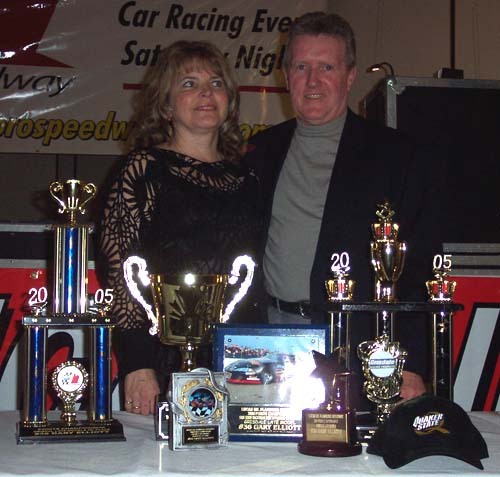 Gary and Nonie had a memorable evening celebrating a spectaular Rookie Season. The two Elliott Teams #36 of Gary and #37 of David, had lots to celebrate gathering many of the awards on Saturday night. Gary and his crew worked very hard during the season to keep the Quaker State Dodge in top appearance. Sometimes this included extensive fabrication work, repainting and new lettering. 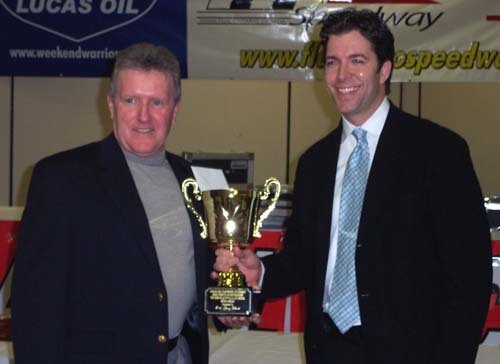 The hard work was worth the effort when Gary won the Best Appearing Car in the Late Model Division. Fourth Place Grisdale Triple Crown! The Grisdale Triple Crown was three fifty lap races run on three different weekends. Gary drove some of his best races in this triple event to finish fourth in the series. Gary has always worked very hard in his relations with fans and the media. 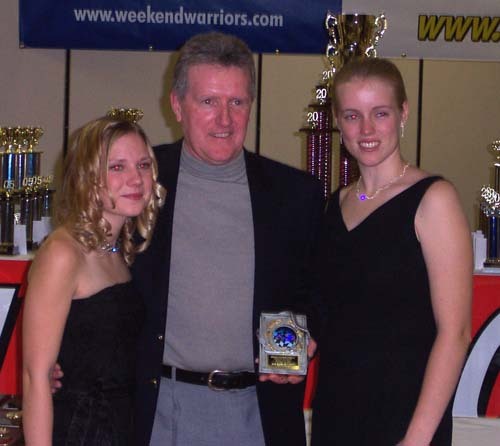 On Saturday night Gary was very honored to receive the 2005 Media Award for his work in promoting the sport. Top five in the Flamboro points from left to right. Flamboro Speedway Owners Frank and John Casale standing behind. Achieving A Goal. Fifth Place Flamboro Points. Prior to the season Gary set several goals. 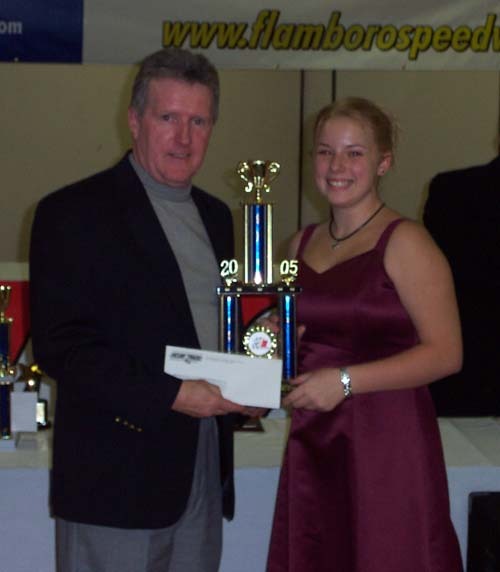 One was to finish in the top five in points at Flamboro Speedway. At several points in the season it appeared as though this goal might be not be attanable. Gary and his team held meetings and decided not to give up. With some spectacular on the edge of his seat driving Gary managed do race his way into fifth place in the final race of the season! Third Place Weekend Warrior Series! The Weekend Warrior Series was designed to promote teams to travel to other tracks on dates when their local track was not racing. 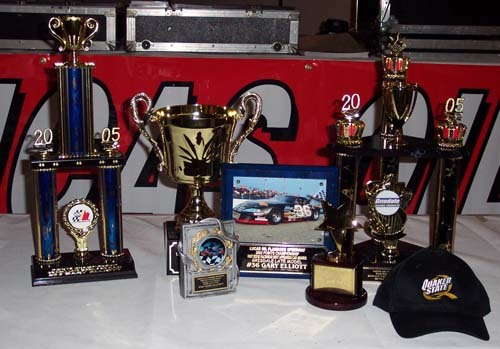 With this Series having all the best Late Model Teams in Ontario competing it was sure to be an exciting year. Prior to the season Gary hoped that he might be able to compete for one of the top nine positions but realistically the Team goal was set to try and finish in the top twenty. 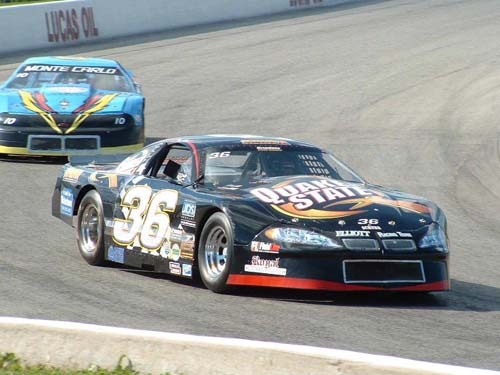 The team made visits to Delaware, Mosport and Kawartha Speedways during the season and posted some respectable finishes against some very strong competition. 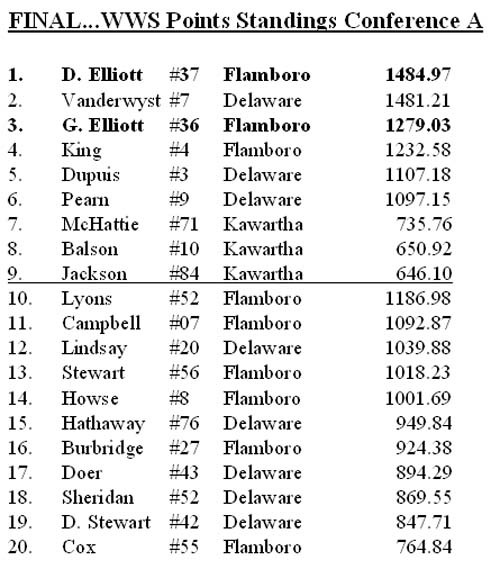 When added to his strong season at Flamboro, the road finishes moved Gary into the the top three in the W.W.S. How was that for exceeding expectations? 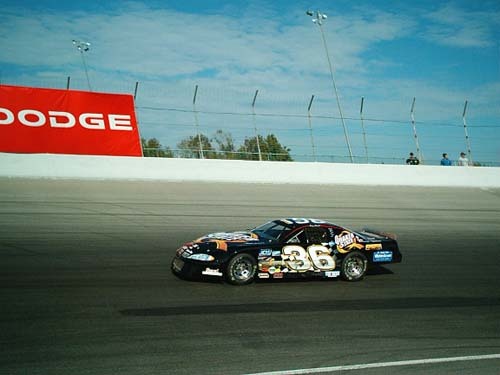 David Elliott started the 2005 season on a strong note. At the mid point engine problems appeared to move him out of contention in both the WWS and Flamboro Series. David and his team re-committed themselves and made a spectacular comeback only to have their hopes dashed in a crash in the Oktoberfest Race at Flamboro. The crash not only caused major damage to the car but also cost them another engine. They appeared to be down and out. 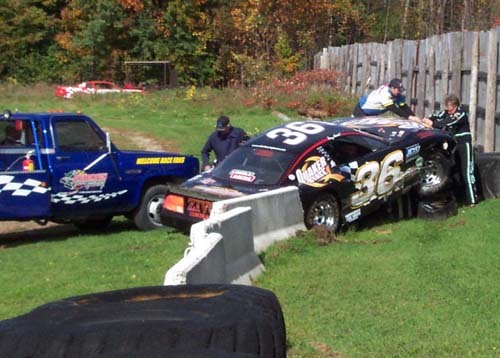 Digging deep and using the Elliott “NEVER GIVE UP” moto the 37 team worked very hard during the week and a new crate engine was put in the car for the Autumn Colors race at Peterboro. David started deep in the field for the 105 lap event. He doggedly worked his way through traffic in an attempt to pass enough cars to win the W.W.S. As the laps counted down it appeared that he might fall short. With seven laps to go David needed to pass one more car to win the W.W.S. but he was a straitaway behind. David bore down and closed on the car and passed it on the closing laps to win the W.W.S! Congratulations to David Elliott and the 37 Team. David Elliott and track owners Frank and John Casale hold up the 1st W.W.S. 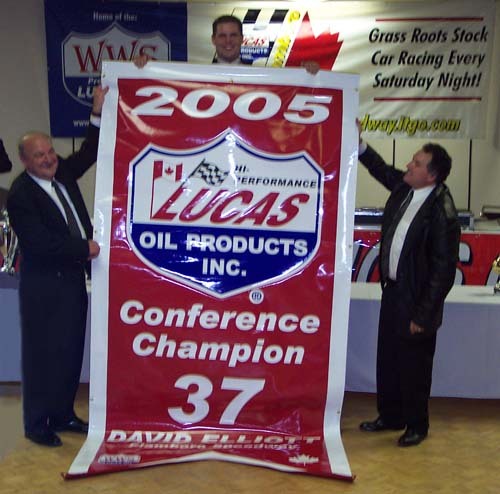 Championship Banner to be displayed at Flamboro Spoeedway. 2005 Rookie Of The Year! Gary felt honored and reinvigorated to win Rookie of the Year. Reflections on a Great Year. What a night for my family, crew and I. We were blessed beyond description. The start of the season was tough. I wasn’t even sure I could drive a Late Model. God blessed us so much and I want to thank Him for the new people we met, for the very exciting races and a great season. 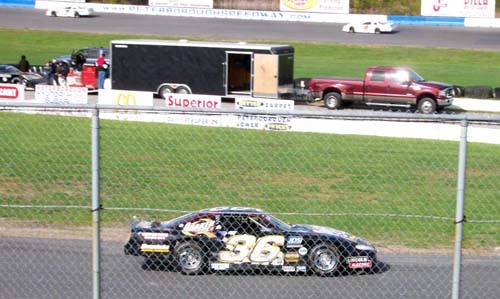 Thirty three years with the Vintage Modifieds brought many good memories and friendships. I teamed up with Jesse Pontello and his wonderful family to compete in the CVM points. Jesse was smooth and improved week after week, taking a few checker flags. Throughout the summer I was able to make three shows. 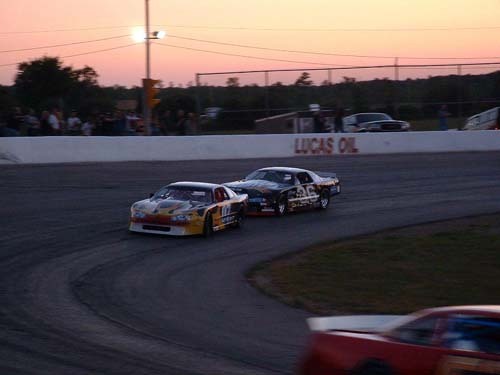 I drove my own car at Flamboro, Dave Watson’s at Varney and Rick Warnes in the Clash. Special thanks to Dave and Rick for giving me those opportunities. I also want to wish Jesse and the Pontello’s the very best as they explore new horizons for Jesse’s future. Our Late Model season was incredible. It was only possible by the generosity and direction of Bill Grisdale. Bill has given tremendous support to racers and tracks for the past three decades. He went beyond the extra mile for us in 2005 and for that we are truly thankful. We ran 100% at Flamboro Speedway, accumulating a total of 24 shows including 4 trips to Kawartha, 2 at Delaware and the Autumn Colors invitational at Peterborough Speedway. Two 100 lappers, six 50 lappers and a 75 lap race were all thrilling races to be in as well my first ever 75 and 100 lap races. We finished 5th in Flamboro points and 3rd in the WWS series. 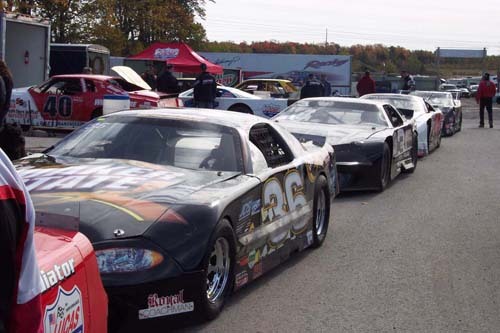 The Grisdale Triple Crown, each a 50 lap event, brought drivers from Delaware to compete. We ended up 4th in that mini series. 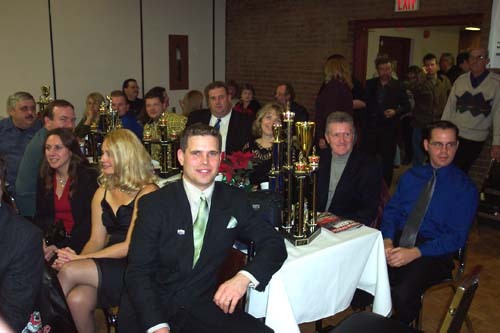 At the banquet on Saturday night we were surprised and proud to win the Best Appearing Car award as well as the Late Model Media driver of the year. By virtue of our points finish we were sure we had Rookie of the Year. This was the 3rd chance for me to take a run for this award. I was a rookie in Mini Stocks in 1969 at Cayuga Speedway, and again with the Hobby’s in 1972. In those inaugural seasons I struggled with the learning curve and did not perform to the level needed to win the Rookie of the Year. 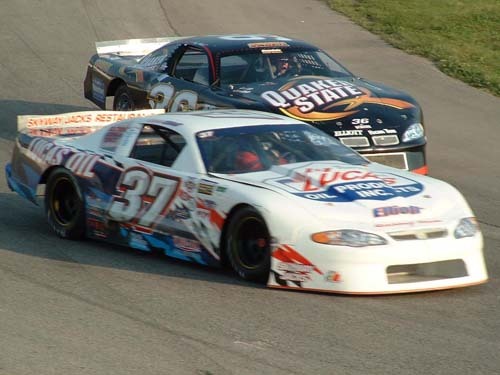 Perhaps it was the long run with the CVM that prepared me for Late Models and gave us a legitimate shot. We were teased all year for being the oldest rookie in Ontario. 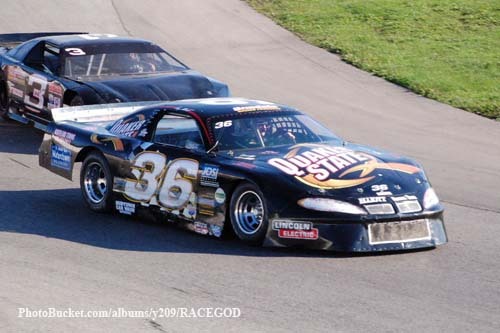 Getting out of a little coupe into the much bigger and faster Late Model was a challenge. I wasn’t sure I could adapt to the change even though my family and crew were very optimistic. After a few weeks, with the help of Thatcher Krupp, the car got easier to drive. He brought stability to our team and we found ourselves very competitive and consistent. That’s what gave us the Rookie of the Year and it is an award I am very proud to have won. I could not have won these awards without the help of my team. I want to thank my crew, Jim Hulzinga, Dave Watson, and Jason Chapman for their excellent efforts throughout the season and to Thatcher who is a genius. Thanks to Steve Zivanic and Amy Miskiewicz who helped when they could. Shirley always let me know that I was the best (no one cheers like a daughter) . I also want to thank all my sponsors for their faithful support. This season was a success because our sponsors gave us the opportunity to be competitive. To all of them we are truly grateful, especially Mark Reed and Quaker State Oil Company for believing in us and being such a great sponsor for the past 32 years. Finally, Nonie, I loved you when I first met you and you’ve shown me again that you are my best friend. Did I tell you yet today? I love you.